Carry a piece of the earth with you wherever you go! This rugged little beauty will keep you feeling aligned with the rhythms of the earth while you’re hard at work; or wear it on the trail for a sense of grounded empowerment! The perfect gift for the earth-loving man (or woman!) in your life! Raw smoky quartz creates the perfect natural centerpiece, accented by simple and sturdy aged brass chain in your chosen length. Wear it with a white tee and charcoal jeans for a simple and stylish earthy urban look. Ordering is easy! Just choose your stone and chain length from the drop-down on the right, click "Add to Cart", and check out using your preferred payment method. Each necklace comes packaged in an earth-friendly, hand-stamped box- ready for gifting! 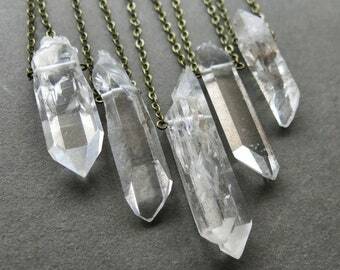 Each of our crystal necklaces is hand made to order. Please allow 1-2 weeks for production. If you have a specific deadline, please let us know and we will do our best to accommodate you! The quality of our current batch of these crystals is mind-blowing - every single one is beautiful! Much of the smoky quartz on the market is irradiated, but not these beauties- these stones are 100% natural and unaltered Brazilian smoky quartz! 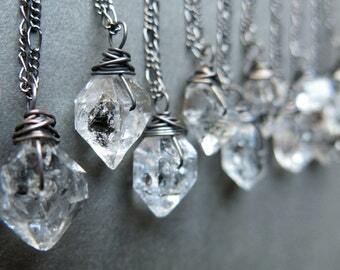 We drill each crystal by hand in our studio so each crystal gets our full creative attention. They range from 30 to 55mm long and 10-18mm wide. 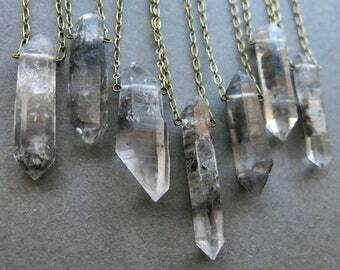 We will choose one of these amazing crystals for you! Typically, we put smaller stones on shorter chains and larger stones on longer chains. If you have a special request for size, shape, or saturation, please let us know in the notes to seller when you check out and we will do our best to make sure you end up with the perfect crystal! Please understand, your crystal is naturally unique and may vary from the product photos, but will be just as beautiful! 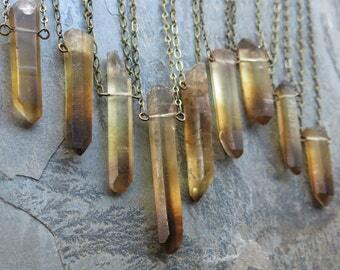 Smoky quartz is a wonderful stone for dissolving trauma, overcoming anxious feelings, and letting go of attachment. It provides grounding, protective, and stress-relieving energies to create space for strength, confidence, recovery, and personal growth. It offers the wearer support to dissolve fear, stress, anger, and resentment, and clear a path for healing. For anyone dealing with anxious feelings, low mood, tension in relationships, or high-stress work environments, smoky quartz can be a wonderful tool. The inner world of smoky quartz is rich with translucent browns, speckles, gradients, and occasionally "ghosts", giving each crystal it's own unique personality. 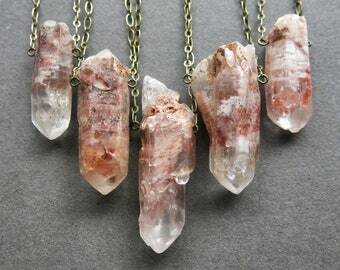 Please note these crystals are in their natural, raw state and may have imperfections where they were pulled from their cluster- we do not consider this a flaw but a story of the crystal and its travels. These are sometimes referred to as "empathy nicks" as they teach us to have more compassion for ourselves and our own perceived flaws. 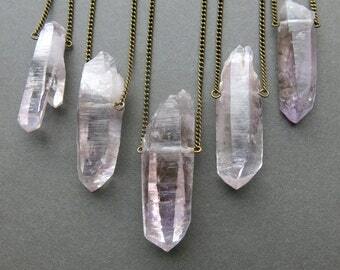 All of our crystals are handled with love and reverence and receive an energy clearing just prior to shipping. • Throat Chakra (18"): Clarity, creativity, and self-expression. • Heart Chakra (24"): Emotional empowerment, love, trust, and compassion. • Solar Plexus Chakra (32"): Personal empowerment, self-love, and overcoming fear. 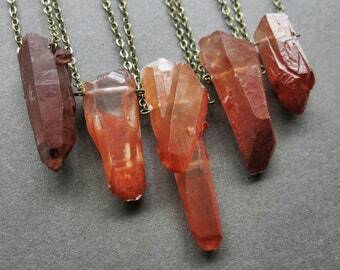 • Sacral Chakra (40"): Passion, intimacy, emotional intuition and connection. Or, choose your own custom chain length and let us know in the notes to seller when you check out. Each of our creations is lovingly hand crafted with meticulous attention to detail, aesthetic, and durability. 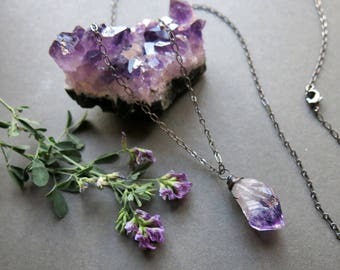 Please note, however, that some crystals and stones are naturally fragile, so handling your jewelry with care is still recommended. Please keep your necklace dry to protect the finish of the metals. 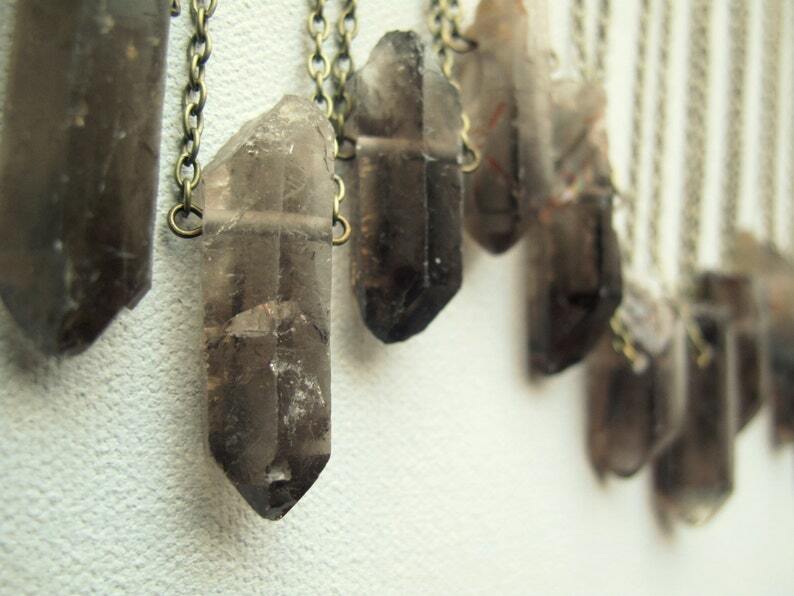 Love my smokey Quartz necklace! Very high quality! Love it! It’s beautiful!